The Metropolitan Opera had a guaranteed 'big seller' in Willy Decker's production of Verdi's much-loved La Traviata well before opening night arrived on New Year's Eve: there were a number of good reasons for excitement. First and foremost, a glass of champagne should be raised in honor of the trashing of the recent Zeffirelli production (unveiled in 1998). Ugly and self-indulgent, it was at best, a second rate effort from a director whose talent for spending money outweighs the freshness of his ideas. Second, Decker's 'new' production was not exactly new, but was debuted to great acclaim in Salzburg back in 2005. At the time, the two charismatic lead singers were Anna Netrebko and Rolando Villazon, and fortunately, the production was captured for commercial release on Deutsche Gramophon CD and DVD. When plans were put in place to bring the production to the Met, the original stars were asked to reprise their roles. However, Netrebko declined to appear as Violetta for a number of reasons, including concerns about having to live up to comparisons with her own performance on the DVD issue. Villazon has suffered a very public vocal crisis that has apparently ended (or at least severely curtailed) his performing career. While these stumbling blocks may have been of temporary concern to the Met's management, all worries have since evaporated: Decker's non-traditional production won instant acclaim with the New York press, and it would appear that ticket sales have been brisk. Most of the near sell-out audience rose to its feet at the conclusion of the performance I attended – possibly in adulation of the individual performers, but I suspect more so in simple awe of the emotional sweep and intellectual fascination of Decker's 'concept'. It was a thrilling night of theater. Much has already been written about Decker's production. Here are the basics: There is a single set – a white, semi-circular, moderately raked 'stadium' with a single door (stage left) and a tall rear wall (about 12 feet at the lowest point) over which the chorus can look down and comment from time to time. 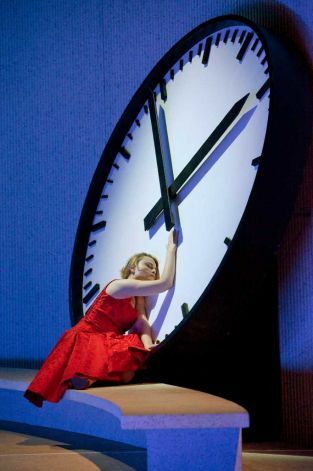 Furniture and props are spare: several white divans and a large, eight foot diameter clock that ticks away the last days and moments of Violetta's life. The color scheme is all white and black, except for Violetta's red dress and a faded pink camellia that figures prominently in several scenes. Brilliant, floral-print robes and slipcovers add vibrancy to the first scene of Act Two, quite blatantly signifying Violetta's few moments of happiness and contentment. But these are removed when Giorgio Germont pronounces his fatal request upon the fragile courtesan. Doctor Grenvil (an extremely patient Luigi Roni) shadows Violetta like the grim reaper throughout the opera – a constant reminder that death is close at hand. I could make a substantial list of the failings of Decker's conception. Chief among them would be the acoustical ramification of his set design. With a single, semi-circular wall, one might suppose that the voices would be directed – funneled, in a way – straight out to the audience. This was not the case, however: much of the time, the voices seemed to evaporate upward rather than out toward the house. I kept wondering how much volume was lost to the wings. Sometimes the singers were heard with crystalline clarity. Other times, they seemed unnaturally muffled, with texts and nuance lost to some unseen sonic vacuum. It was a frustratingly inconsistent aural experience that almost certainly had to be a consequence of the unusual set design. Aside from this critical flaw, however, the remaining small detractions were far outweighed by the way Decker focused attention on Violetta's plight and her associated emotional shifts. The symbolism may have been blatant, but it served to magnify the tragedy by underlining Violetta's desperation and ultimately, her surrender – first to love, then to death. To a large extent, Decker contrived to erase the minor characters from the dramatic proceedings. Consistently dressed in grey or black, Flora, Annina, Baron Douphol, and the rest simply faded into the scenery – frankly, an appropriate fate for roles too often aggrandized by over zealous compramarii. What was more surprising was that Decker paid similar treatment to the Germonts, though perhaps his approach was diluted by about half for the two obviously important men who would have such a vivid impact on Violetta. Both Alfredo and Giorgio Germont were reduced to mere window-dressing by the end of the opera. Dressed in grey and black, they sat motionless on the periphery while Violetta struggled and died alone. It was a daring directorial choice, and led to an exceedingly potent conclusion. With all of the vividness on stage, it should have been easier to overlook that fact that the usually outstanding Met orchestra sounded ragged and under-rehearsed. Certainly the latter could not have been a factor, as they must all know the score from memory by now. Perhaps the blame belonged to conductor Gianandrea Noseda. 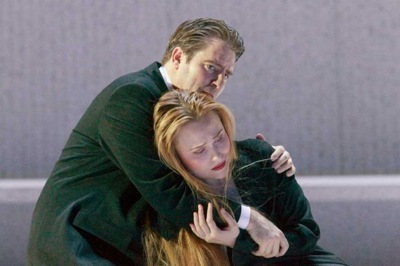 I have been impressed by his sensitivity and control in the past, but something was clearly amiss with this Traviata. At several points early on, coordination between the orchestra and chorus drifted apart by as much as a full beat. Even in the two famous preludes, the orchestra sounded wan and devoid of emotion, rather than intense and laden with anticipation. With almost none of the traditional clutter of 1850's Paris to hide behind, the principal singers carried the full weight of the drama and needed to depict the unfolding plot through convincing acting in addition to traversing Verdi's demanding vocal requirements. Baritone Andrzej Dobber offered an appropriately implacable Giorgio Germont. Though Verdi provided him with beautiful music and several emotionally meaningful scenes, the elder Germont is a famously cardboard character. Dobber offered nearly perfect vocalism: his voice is absolutely even from top to bottom and there is an easy, relaxed manner to his singing. Even in the most emotionally gripping moments, Dobber never sang with less than absolute precision, and thus, paid full respect to Verdi's phrasing, note values, and dynamics. Still, his utter reserve only served to underline the two-dimensionality of his character. One could hardly have wished for higher quality vocalism from tenor Matthew Polenzani. His phrasing was immaculate, pitch was infallible, and diction was superior. The only flaw – one that he can't control – is that he simply doesn't possess an Italianate tone. This is a small, but significant detraction. His acting has always been rudimentary – a potential problem when he shares the stage with a magnetic actress, as he did with Anna Netrebko in the Met's recent Don Pasquale. However, he surpassed all expectations in this regard as Alfredo. He held nothing back physically, and offered a truly believable characterization. His stage presence remains somewhat stolid – his doughy facial features and rounded physique undermine his efforts to fashion a traditional 'leading man' image. Nevertheless, all of Alfredo's emotions were vividly conveyed and he didn't disappear from view when Poplavskaya was on the stage – a notable achievement in itself. Certainly, I would prefer Polenzani's earnest efforts to the clownish results so often achieved by Villazon. After scoring a significant success as Elisabetta in Verdi's Don Carlo a few weeks ago, soprano Marina Poplavskaya stepped into Violetta's now iconic red shoes with the strong will and attitude of a prize fighter. She was fascinating to watch. Her Violetta was a tour-de-force: an overwhelmingly physical incarnation that convinced by sheer determination. You will care about this Violetta. I marvelled more than once at how she simply dominated the proceedings, holding the audience in the palm of her hand and making us forget that this wasn't a one-woman show. Surely, this is what Violetta should be: charismatic, strong, flawed, beautiful, magnetic, and vulnerable. Poplavskaya offered all of these and more. From an acting standpoint, it was one of the most riveting and convincing performances I have seen on the opera stage in years. Her success in this regard was all the more remarkable, given the fact that she has enormous trouble coping with the vocal requirements of the role. While her participation in Don Carlo showed a wilful singer able to pull her voice together at all the critical moments, Violetta offers a much different – and merciless – set of challenges. Her register breaks were consistently on view and negotiated only with effort and occasionally audible vocal 'gear shifting'. Her high notes were alternately thin and poorly supported or blasted out loudly. Her phrasing was often broken up by the need for extra breaths, and she frequently strayed from the correct pitch. Vocally, it was an undistinguished performance – certainly not in a league with other recent exponents (Netrebko, Fleming, Gheorghiu, et al.). And yet, despite her vocal shortcomings, it was a towering performance: the force of her overall interpretation simply swept aside all criticism. 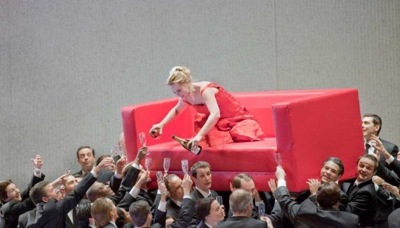 She richly deserved the tumultuous ovations at the opera's conclusion. This is an important production that should be seen by all who love La Traviata, and hopefully, the Met will continue taking such splendidly rewarding artistic risks. And by all means, let us hope they continue to engage Poplavskaya for as long as she is able to keep her vocal technique glued together. She is a gifted artist with a rare talent: she has the guts to make us look at opera from a different point of view. Photo Credits: Ken Howard/ The Metropolitan Opera.